This tutorial will cover some of the common steps for creating, applying, and augmenting genetic marker maps in SVS. 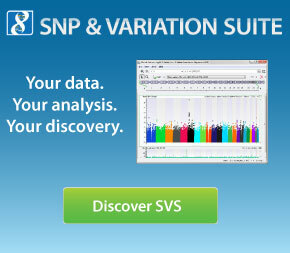 SVS uses a genetic marker map to identify the genomic coordinates of SNPs and other genetic features in a spreadsheet. Marker maps are the basis for data visualization in GenomeBrowse as they provide relative order, size and scaling of each feature included in the spreadsheet. For different species the size, order and naming of the chromosomes can differ greatly so an accurate marker map is essential for correct visualization of data. Marker maps are also used to inform certain analysis functions (such as Haplotype Analysis, DESeq Expression Analysis or CNV segmentation) about the relative order and length of features on the genome. For the DESeq Analysis tool the length of each gene (or isoform) region is essential in determining expression values– the length is determined using the start and stop position listed in the marker map of the spreadsheet. Additionally, marker maps can be used to gather annotation information (such as RS Identifier, Classifications or Functional Predictions) into one central location. This information will then be available in the output of any subsequent analysis on that spreadsheet. To follow along you will need to download and unzip the following file, which contains the starter project for this tutorial. 500K Geno HapMap Data - Sheet 1 - this spreadsheet contains a set of SNPs from the HapMap Project. This is not the full dataset but a subset of filtered markers. Affy 500K na32 Filtered Markers - Sheet 1 - this spreadsheet contains information for a basic marker map with chromosome and position together with an additional RS ID field.